In the early days of the railroad, A turntable was almost standard, as was the roundhouse. what better way to turn around a locomotive in its own length ! Oregon was full of turntables, all buried now, existing only in photographs today. 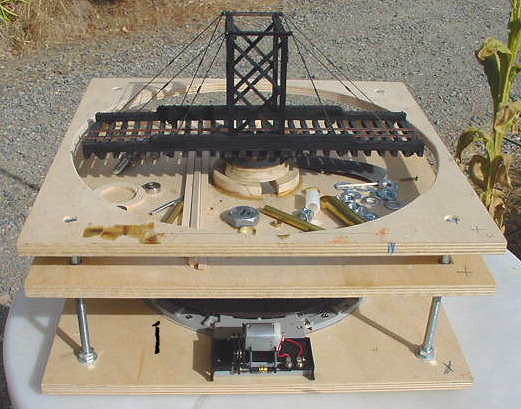 Building an indexing turntable, is somewhat challenging, but after a great deal of time and energy, I have arrived at a way to accomplish the feat in a compact, reliable unit. The photographs will be updated, as well as eventually adding drawings and construction details so that you can build your own. Once you accomplish this feat, you will understand why the few that make them charge $1200-$2500, but you will enjoy the thrill of remotely turning around your engine. How about a roundhouse with remotely opened doors? Technology has made available some really cool stuff for doing exactly that! Do not try this at home, as the saying goes, unless you are of sound mind, and not prone to a dirt nap. 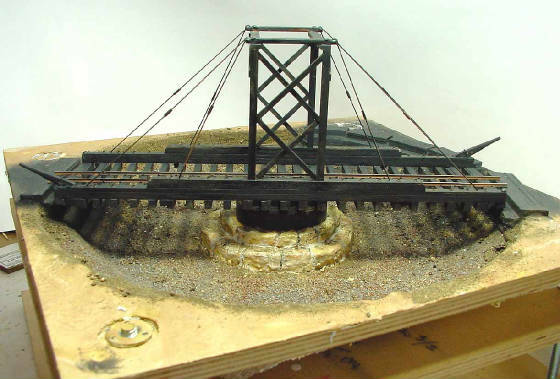 After 3 months of constant work, and trying many ideas for attaching the bridge to the post so that it indexes exactly and has electricity to the rails. My newest attempt worked, but then, a small nut or screw found its way into the atlas drive mechanism, facilitating a disassembly, easily achieved by remving the locks and raising the turntable-cool! Actually works 100% accurate in one direction, and within 3/32 when reversed. Drawings will soon be available.